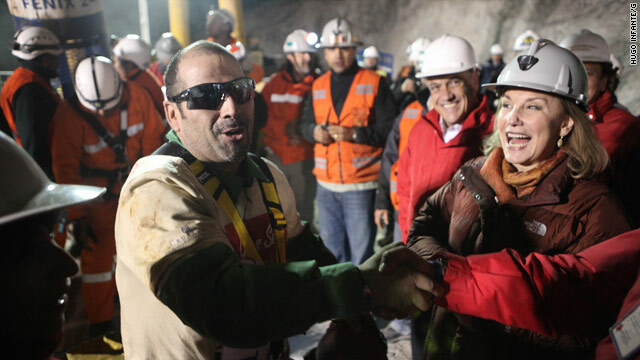 Mario Sepulveda, the second miner extracted, said he hoped to maintain a low-key profile. (CNN) -- As the rescue capsule brought each Chilean miner to the surface, they sprang from obscurity into the global spotlight -- a type of attention that they never sought. The 33 miners, who had been stuck for nearly 70 days inside a mine near Copiapo, Chile, will likely feel the crush of media requests and offers from book publishers, movie and television producers. They will probably be peppered with questions from family, friends, neighbors, strangers and reporters. When ordinary people are thrust into the spotlight, it can be disorienting and stressful. How they handle that attention could progress or hinder their recovery, experts said. "The only thing I ask, personally, is that you please not treat us like celebrities or journalists. I want to continue being treated like Mario Antonio Sepulveda Espinace, the worker, the miner. I love that, and I think that in some shape, way or form I want to continue working," he said. In his book "The Frenzy of Renown: Fame and Its History," Leo Braudy writes about the effect of sudden fame for unintentional newsmakers. "It's a great problem for regular people, who are subjected to intense publicity and focus," said Braudy. Sometimes, it's ordinary people who've done something heroic or rescued someone. "They're lionized; and for some of them, it destroyed them," he said, referring to a incident in which a paramedic who rescued baby Jessica McClure from a Texas well took his life years later. But everyone responds differently, he said. It could be complicated for the miners to re-enter society and find normalcy in their lives when there's so much global curiosity. Viewers tuned in around the world to watch their rescue. Ramon Sabella survived a 1972 plane crash in the Andes Mountain. He and his fellow survivors' story inspired the book and movie "Alive." After his rescue, so intense was the attention from reporters and photographers who followed Sabella that he found cameras in his hospital bathroom. His advice to the Chilean miners: Spend time with family and friends and try not to be overwhelmed. "Remember, it's going to be a limited time span. It may be weeks, but then go back to real life. There's going to be attention, media scrutiny, books, movies -- that's not normal life," he said. "Don't live exclusively for that [attention]. Tell your story, but live your life." Read more about Sabella on the Chart. The publicity could have benefits and harm, said Dr. John Markowitz, a research psychiatrist at the New York State Psychiatric Institute. "To the extent that publicity made the survivors feel like heroes and cared for by the outside world, it could be supportive," he said. "We know that social support protects against psychopathology for trauma victims." "On the other hand, if the survivors felt exploited, intruded upon and then discarded by the media, I imagine that the effect of media coverage could be negative." After a life-threatening event, people who feel supported are less likely to get post-traumatic stress disorder, Markowitz said. The fact that the miners survived as a group is a mental health benefit, he said. "One thing is solidarity," Markowitz said. "They're not in this alone. They have this kind of social support." About 8 percent of people who have been through a traumatic event are likely to get PTSD, said Dr. Katherine Muller, director of psychology training and a clinical psychologist at Montefiore Medical Center in New York. Workers would have to be monitored for PTSD symptoms such as avoidance, nightmares and re-experiences of the trauma, she said. "From my perspective, people who talk about the experience, think about it and discuss it, tend to do better and don't end up with PTSD." After a traumatic incident, it's important to resume day-to-day life, spend time with family and friends and get some normalcy back, she said. It might be difficult to get back to normal as the miners will probably "to be treated for a while like movie stars," Braudy said. One of the downsides is that the miners may be inundated with requests and pulled in many directions. "That's a downside," he said. "People confuse fame with money, fame with richness -- and they want a piece of you." The point is not to add stress to the miners by prying, said Tyler Cowen, author of "What Price Fame." "These people didn't ask to be put in that position," he said. "There is some right to privacy that might end up not being respected. It's not like they are performers, who go on stage and deal with reviews. These people are victims."